This is the fourth part of a series about symmetry in origami. 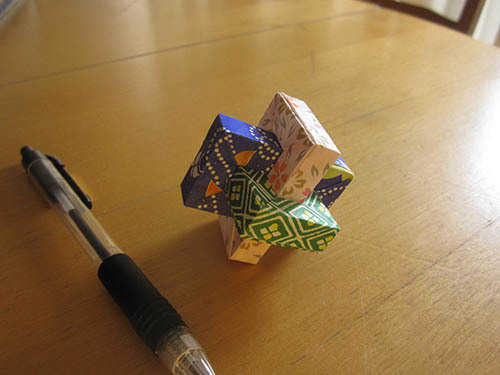 Given an origami model, what are the possible symmetric colorings? This is a question I posed in an earlier post, and I said I didn’t know the solution. I thought about it a lot, and I found the solution. I will write up a mathematical proof in a later post. Here I will just explain the result. A brief review: Each origami model has an associated shape symmetry group, which is the set of all transformations (rotations and reflections) which leave the shape unchanged. There is also an associated color symmetry group, which leaves the shape and colors unchanged. Then there is the pattern symmetry group, which may swap the identities of some of the colors, but leaves the color patterns unchanged. In this post, C is the color symmetry group, and P is the pattern symmetry group. I defined a “symmetric coloring” to be one where P is “large” and C is “small”. I didn’t say how large P needed to be, or how small C needed to be, but it doesn’t matter. I found a method that can construct any and all symmetric colorings. Suppose we want to find a symmetrical coloring of a cube. First question: Are we assigning a color to each face, each vertex, or each edge? We want to find a general solution that will work in all three cases, as well as any more complicated case. So the first thing we need to do is divide the cube into fundamental domains. Each triangle on the cube’s surface represents a fundamental domain. In total, there are 48 fundamental domains. Cooperative board games are difficult to design. One major failure mode of a cooperative game is one player directing all the others what to do. At that point, it becomes a one-player game, only there are several additional people sitting around being bored. One of the best-known cooperative games, Pandemic, has this problem really bad. Pandemic requires players to carefully coordinate in order to contain several diseases as they spread throughout the world. Unfortunately, the “careful coordination” often amounts to the most experienced player telling everybody else what to do. This is often a winning strategy, because the more experienced player can usually unambiguously identify the correct move. I refuse to play Pandemic for this reason. But I do like other cooperative games. Here I’ll go through some examples and describe how I think they address the issues with Pandemic. As many readers know, I run a group blog, The Asexual Agenda (TAA). Other readers might be aware that I’m on this blogging network called Freethought Blogs (FTB). Still other readers may be aware of other blogging networks like The Orbit, or Skepchick. Have you ever wondered how these blog networks are organized? This is something that interests me, as a group blog admin. But perhaps nobody else is interested, because I hardly ever see anyone else talk about it. Or perhaps people don’t talk about it because the information is too sensitive. You don’t want to give away information that is potentially embarrassing to other people on the network. Many blogging networks may even have formal rules against disclosing certain information. I myself am limited in what I can say. But there’s some stuff that is public knowledge, at least in principle, so I’ll talk about that. It’s my monthly feature where I share links I’ve collected over the past month, and offer brief commentary. The Trans Reveal – I recently found this blog that reviews queer webcomics and of course I’m all over that. This article discusses various ways that webcomics can reveal that a character is trans, and what the pitfalls of each approach are. Exodus: Why Americans are Leaving Religion—and Why They’re Unlikely to Come Back – This is an old article summarizing results from a survey of religiously unaffiliated USians. What I found most interesting: 1) the main reason for their growth appears to be increased retention rates, 2) 58% of them say religion is bad for the world, and 18% say religion is personally important to them, 3) The people who say religion is bad for the world are more likely to be white, male, and have more education. I found this article via Aged Reasoner–although the speculation in that post is mistaken, as I point out in the comments. Why we really really really like repetition in music (video) – Vox talks about how we seem to find repetition inherently enjoyable in music, but not, say, stage plays. Something that I have great difficulty understanding is how music worked before recordings existed. It seems like music should have been more repetitive in those days, to make up for the fact that you couldn’t just repeat the recording as desired. Vox incidentally mentions the speech to song illusion, which is the most compelling auditory illusion I have ever heard. Listen to this video, and then listen to it again. What has been heard cannot be unheard. This is the third part of a series about symmetry in origami. Previously, I established the idea of a symmetry group, a set of transformations that leaves a model’s shape unchanged. Next, I talked about how the colors of a model define a subgroup. In this post, I will explain the concept of a normal subgroup. We begin with a case study of one of my favorite models, Thoki Yenn’s Umulius. “Umulius” is a Danish insult meaning “impossible person”. 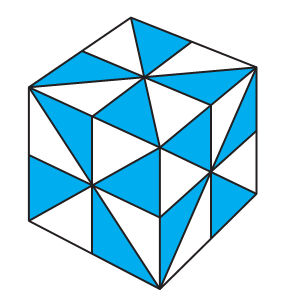 Ignoring the colors, the Umulius nearly has cubic symmetry. Here I have a series of diagrams “cleaning up” the details to make the underlying cubic symmetry clear.